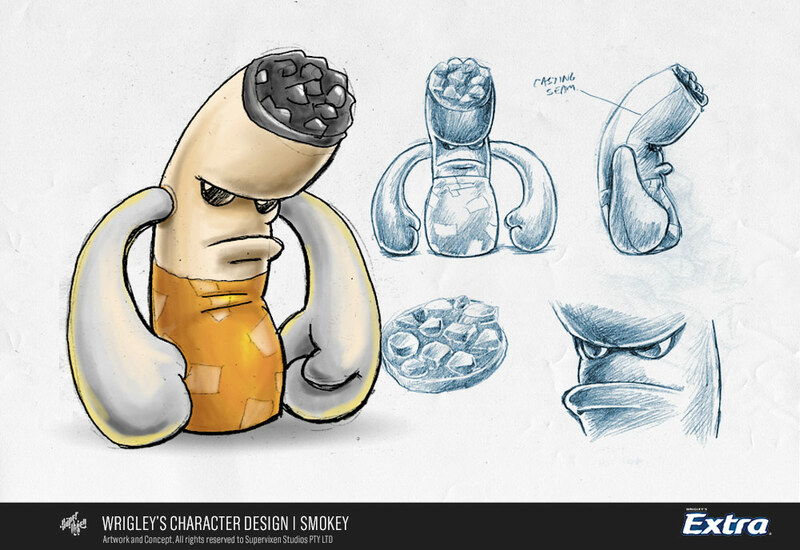 Directors Josh and Jon Baker of TWiN needed a series of characters designed for three upcoming commercials to revitalize the Wrigley's brand. 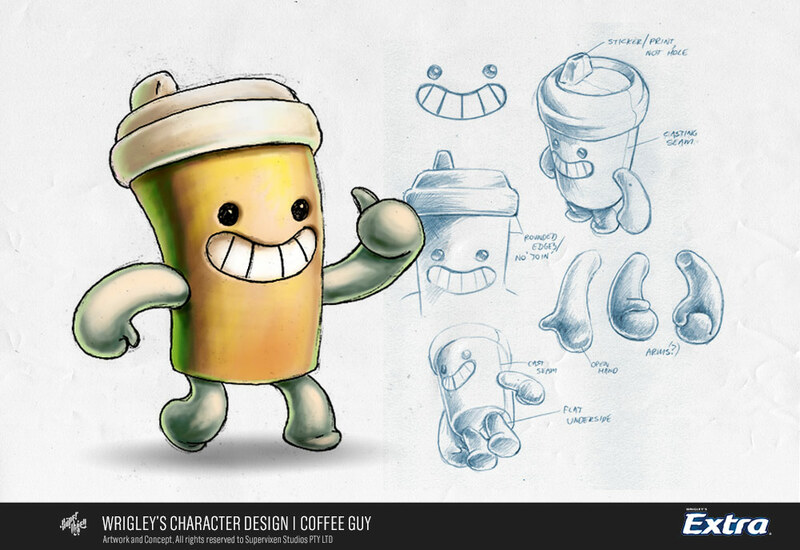 The characters had to be cute, originate from food objects and be able to interact with the real world. Created in the style of "vinyl" toys, these characters were created in 3D and comped into a live shoot. The commercials spawned a whole series of fan-made art. The wrigley's spot was brought to SVPERVIXEN from an unlikely reference. Jon Baker of TWiN called about a potential character design job, more specifically something that reminded him of an image he saw long ago that Morten had done during high school. A small sketch of come characters in the back of a sketch pad that Morten had uploaded as a background texture for something seemingly more important at the time, became the kick off to setting the style of what was to become the Wrigley's food characters. Initially the brief was to illustrate foods as characters in the vinyl style, characters that would be right at home in the Kid Robot collection of toys, and to select the kinds of foods that would "Hang Around" after you ate them. A shortlist of the most obvious foods were made, Pizza, Coffee, Cigarettes (yeah, thats not food but...) and then beyond that it was a case of whatever would make a great and memorable character. Some of the many characters made in the process of deciding the final 8. Working through a sheet of each food, we were able to refine down the foods we thought made great characters and features we preferred. In some cases it was a game of Mr Potato Head, swapping mouths and eyes, legs and arms, to finally come up with some unique "Best Of" characters. After the refinements were made and the colours decided on, pose sheets and more detailed elements were defined in further explanatory illustration for the modellers and animators to work with. Feedback from the Agency at the time was that the characters were too appealing, and need them to be more "grotesque". The Directors and us persevered with the goal of making the characters appealing, much to the dismay of the agency creatives. 3D Modelling, Animation, and compositing was done at Fuel VFX. We were on hand to guardian over the characters and make sure they were executed as close to the concepts as possible. The meant redrawing and detailing elements that were specific to particular poses and actions they were to carry out in the live action plates. The traits of each character was really brought out in the unique animation they were given. It takes multiple viewings to catch the the small jokes each character brings to the sequence. The wine bottle stumbles as he walks, the Sushi uses his finest ninja moves to traverse the train, and the donut on occasion simple roles to his destination. After the two initial spots of the Wrigley's characters were aired they were met with an unexpected public reaction. The characters had instant appeal and a flood of emails to both the directors and us asking for merchandise involving the new characters came in. What was supposed to be a couple of one off commercials reignited the interest in the brand. At the time the only characters advertising products on TV was a very short list, with the Wrigley's characters people instantly fell for the charm of a new, not so in your face advertising style. The Official Wrigley's Chewing Gum character fan page has received a constant supply of fan made art and contributions, and despite the current change of direction, the original characters continue to see the light of day on the Packaging and advertisements around the world. 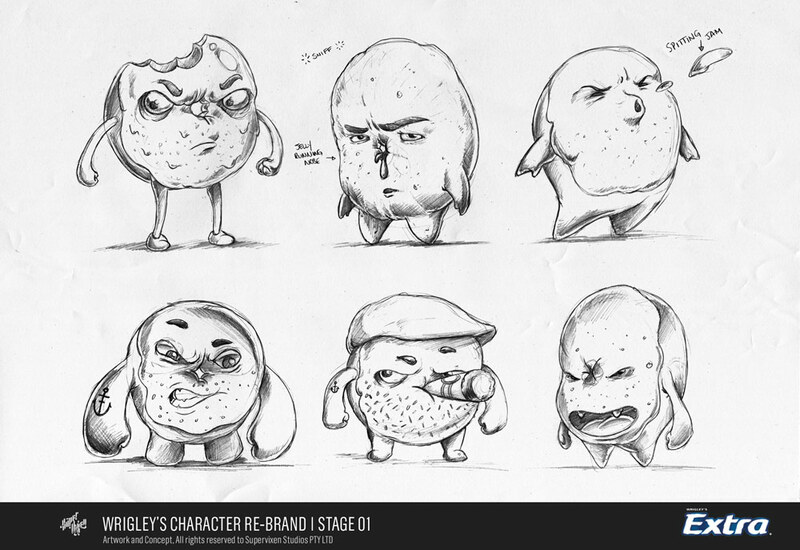 Over the years the Wrigleys characters have evolved under the guidance of other creative/production companies, with the initial goal of making them "more ugly". To a large extent, the lineup of characters has remained, though the look has departed from the original characters we created. We have however, been invited to work on the revised designs, to create characters that are repulsive, realistic, and with a different purpose than the original 8. There is now an internal story line for each character and the roles they play with each other, and recently have starred alongside Antonio Banderas In a 30second TVC for Australian TV. The Characters live on in some form or another still, and have made their way around the world as representatives of the Wrigley's Chewing Gum brand, regardless of their evolution in time, you can still see the original Coffee Character on the inside wrapper.